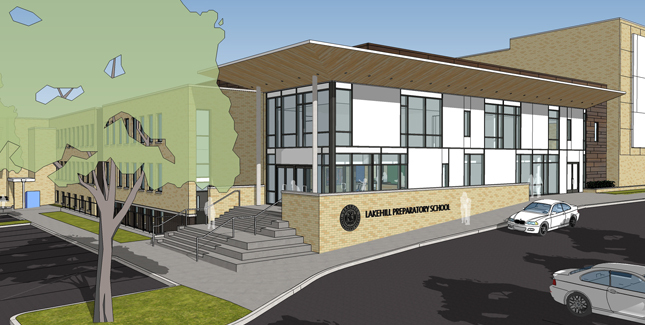 Established in 1971, Lakehill Preparatory School continues to build on its original goal of establishing an independent, college preparatory school of outstanding quality and credentials in the Lakewood/East Dallas community. Lakehill is a highly regarded, fully-accredited, co-educational school for students in Kindergarten through Grade 12. As an academic community dedicated to the whole student, Lakehill combines a robust, college preparatory curriculum with opportunities for personal growth, individual enrichment, and community engagement. Small class sizes ensure a supportive learning environment and personal attention. From kindergarten through high school, every Lakehill student is encouraged to strive, challenged to succeed, and inspired to excel. Lakehill’s Main Campus is located in the heart of Lakewood and is within easy reach to all areas of Dallas. New for the 2017-18 school year is the completion of a 16,000 square foot expansion project, with an additional 8,000 square feet of renovated space. The expansion added new lab spaces for science, writing, and computer science, a performance theater, as well as an art studio. New classrooms, meeting and event rooms, and administrative offices have also been added. A centerpiece of the project is a 5,000 square-foot inner courtyard that provides outdoor classroom and performance space. The Roger L. Perry Campus, located just four miles from the Main Campus, is home to the Warrior Athletic Complex and the LEED-certified Alice and Erle Nye Family Environmental Science Center. This facility houses athletic fields, a field house, laboratories, classrooms, and meeting space. With over 40 acres of land to explore, Lakehill students have the opportunity to experience nature in a pristine environment. Lakehill is committed to providing students in kindergarten through high school with a unique and high-quality education and to helping young people develop – not only as students, but also as well-rounded individuals. Lakehill is a member of the National Association of Independent Schools (NAIS) and is accredited by the Independent Schools Association of the Southwest (ISAS).